We all know TeamViewer, the remote desktop client for smartphones which has been available officially on iPhone, Mac OS, Windows phone and Android, but not Blackberry. If you don’t know what a remote desktop client (RDC) is, it’s an app or software that let’s you control your PC from any other device. To use an RDC, the software must be installed on both devices for it to work. I remember in the past when I owned a Nokia 5300 java mobile phone, I installed a remote desktop client (can’t remember the name) that allowed me control the mouse and click around my desktop with the phone buttons. Although there wasn’t much use to it back then, but it was fun. 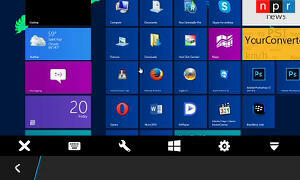 Now, RD clients on smartphones has way more features and can be used to carry out most tasks on PC. There are a handfull of other remote desktop clients available (RDM+, AccessToGo, SplashTop) which could be installed on a Blackberry, but many BB users just crave the experience TeamViewer offers other smartphone users. You can run TeamViewer on a Blackberry OS 10 device by ‘properly’ side loading the android variant on your Z10, Q10 or Playbook. 1. First make sure you are not running a ‘locked’ version of the Android runtime, as trying to side load Teamviewer on a locked runtime will produce “Error Loading Library”. I got this error on my device before downgrading to the 10.2.0.810 Android runtime which is unlocked. I think all versions after that is locked. Note that this sideload has only been tested on the Z10 running OS 10.2.0.1725 and Android 10.2.0.810 runtime even though I believe it would work on other OS 10 devices. 2. Download the TeamViewer .bar file from the MediaFire link below. 3. Side load on your BB10 device.